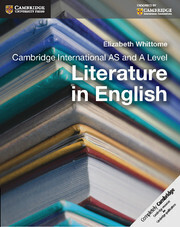 Comprehensive student-friendly resources designed for teaching Cambridge International AS and A Level Literature in English (syllabus 9695). 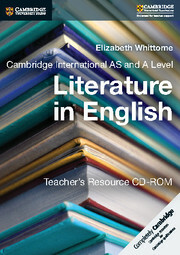 This Coursebook is a comprehensive guide to the study of Literature in English at AS and A Level, encouraging both the enjoyment of literature and rigorous academic study. It provides a clear approach for any Literature studies syllabus, and is divided into three parts: Part 1 and Part 2 covering poetry, prose and drama at AS and A Level respectively, and Part 3 covering key skills needed to succeed in assessment. It contains a range of stimulating literary material from around the world, including poems and extracts from plays and prose fiction, selected to include Cambridge set texts. Robust and accessible guidance to achieve success at A Level Literature in English – both printed and electronic. Assessment resources to take students (and teachers) through the process of how to plan essays and coursework. Exam questions, sample answers and real examiner commentaries help to unpick the approach needed to do well in the exam. Exam-style questions, sample answers and real teacher commentaries help to unpick the approach needed in an exam. Builds skills for poetry, prose and drama study through a wealth of student activities. Culturally diverse text extracts that are carefully selected to include Cambridge set texts, but are useful examples for any syllabus.